A total of 42 states and the District of Columbia have adopted the Common Core State Standards (CCSS) for Mathematics and English Language Arts. An engaging and effective way to meet these standards is through classroom engineering—and Engineering is Elementary offers convenient CCSS Alignment Guides to help you make the connections. Watch this short video to see how engineering a parachute calls on kids’ measuring skills. 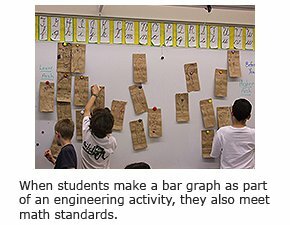 How does engineering support elementary students in learning mathematics and ELA? Skill-based math practices are built into the activities in almost every EiE unit—practices like making sense of problems, persevering to solve them, and reasoning both abstractly and quantitatively. Meanwhile, the EiE storybooks—and the many writing activities embedded in the EiE units, including journaling and writing persuasive letters—provide loads of opportunities for students to practice the literacy and writing skills required by the CCSS. For a great example of how a single EiE lesson can support both Math and ELA standards, take a look at lesson 2 in the EiE biomedical engineering unit No Bones About It: Designing Knee Braces. The Common Core math standards in the “measurement and data” domain for grade 2 specify (among other goals) that students should both represent and interpret data. That’s what students do in this lesson. First, each student measures the arch of his or her foot, as part of an exercise in designing a new running shoe. Then, students aggregate their data on a big bar graph on the classroom wall, to see where the numbers cluster. How Do You Connect EiE to Common Core? Explore our convenient alignment guides to see how each of the 20 EiE units helps you address multiple learning goals under CCSS. These alignment guides are organized by grade, from first grade through fifth. They show the connections between the standards and the activities in each of the four lessons in each of the 20 EiE units. Long before we started mapping EiE to CCSS, EiE’s curriculum developers had already put together other useful tools for connecting engineering activities to state and national standards, including a wide variety of extension lessons, available to download from our website. EiE’s professional development team has created a new professional workshop, “Linking the E & M in STEM,” for teachers who are new to both EiE and CCSS. Fourth-grade teacher Caitlin Nunez of Plainville, MA, has participated. You can find the concise CCSS alignment guides on our website—along with similar resources for state standards and the Next Generation Science Standards. Take a look, then write and tell us what you think.